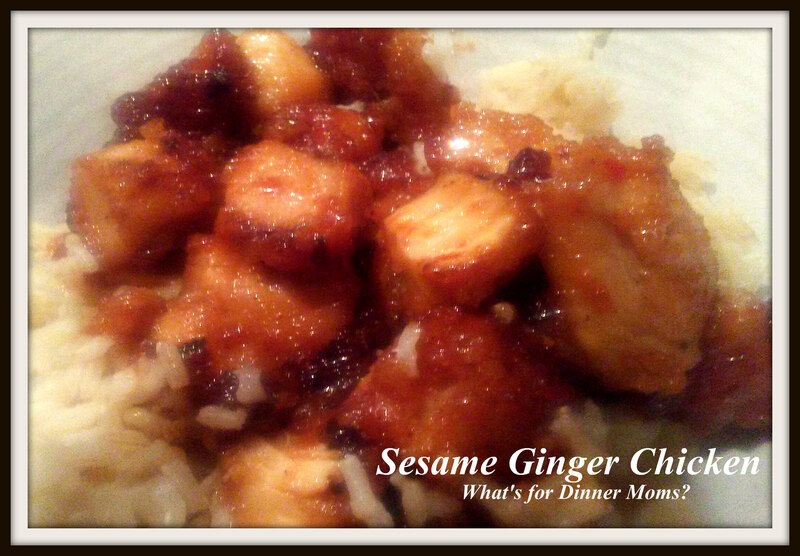 Sesame Ginger Chicken – What's for Dinner Moms? We love Chinese food but it can be very expensive and you don’t always know what is in it. If we make it at home we can control the ingredients and how we cook it. More oil, less oil, steaming or baking it is up to us. We started with the recipe for Sesame Ginger Chicken from the Food Network (click for link to recipe). I encourage you to do make it your own. We had no oyster sauce, Thai chili sauce or fresh ginger so we left those out. But, we needed to make up for the liquid we were taking away so we added a bit of extra of what we did have on hand and I had some powdered ginger to add. Remember if you take a liquid out of a recipe you must replace it with another to get a similar consistency. Well, I really liked this dish. It had great flavor and was not overly difficult to make. I changed the way the chicken was done to not use quite as much corn starch or to make the breading quite as heavy. We had this over brown rice with a side of steamed vegetables. Mix sesame oil, sugar, soy sauce, black pepper and chicken in a bowl until well coated. Cover and refrigerate for at least one hour. To make stir fry: Add 2/3 cup cornstarch to a large bag. Remove chicken from marinade to bag and toss to coat all pieces. Add oil to a pan to fry chicken in. Fry each piece 3-4 minutes until cooked through and turning golden brown. Remove chicken from pan to a paper towel to absorb any excess oil. In a large skillet heat 1 tablespoon oil over medium heat. Add garlic and sprinkled with ginger to pan. Stir for about 1 minute until fragrant. Add rice wine, hoisin sauce, soy sauce, honey and chili sauce to pan. Allow to come to a simmer. In a cup mix 2 tablespoons corn starch and 2 tablespoons very cold water until smooth. Pour into simmering sauce and stir until thickened. Taste and adjust sauce spices as needed. Add chicken and lemon juice to sauce and stir well. Serve over hot rice if desired. Next Post Do You Have a Leftover Meal? Sounds very nice, Marci. I don’t generally like Chinese food but this sounds quite yummy. Thank you! It has become one of my favorites along with Lebanese foods. Never thought I would ever care for either of them but they have grown on me. You can’t go wrong with Chinese food. Always a winner on our dinner table. Sorry I’ve been missing so many of your posts, but the food cart has kept me away from my laptop. This looks delicious, even with the photo! Yum! Thank you! The food cart has been going well then? Hope so!! !